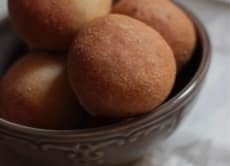 I host vegetarian cooking classes and natural yeast bread baking classes at home; they are based on Macrobiotic theory, and I don't use meat, fish, egg, white sugar, and chemical products. I've learned cooking in Tokyo (Natural Food Director School, Natural Bread School, Kushi Macrobiotic Academy, etc) and London (Le Cordon Bleu, various cookery school, etc) and I've worked at Cafe 8, the vegan vegetarian cafe in Tokyo and worked as a bakery teacher at a school in Tokyo before I started hosting classes at home. It's my wish that as many people find out how delicious, beautiful, and enjoyable a meal using organic food is. So in my classes, I propose various entertaining dishes that the students can enjoy with their "five senses". I believe that the purpose of eating food is not only to keep our body functioning, but also to enjoy our life. So I make the menus in my classes always thinking of how the students can enjoy and feel "satisfaction" both visually. The dishes also help you become healthy and calm. Let us enjoy 'natural bread with vegetable dishes' made with Japanese ingredients! Let's enjoy "vegetarian course menu" with Japanese ingredients! Akiko was such a wonderful knowledgeable teacher. The recipes used many traditional Japanese ingredients but prepared in creative ways resulting in delicious vegetarian dishes like we have never had before. She warmly welcomed us into her lovely home and the lessons were well planned out, we worked together and the meal was on the table before we knew it. She even gave us recommendations on some of her favorite restaurants in Tokyo. Highly recommended! Akiko was a fantastic instructor. She prepared the menu with recipes and reviewed all the recipes before starting to cook. We then jumped in and started cooking and had a wonderful dinner to end...she was a delightful person to learn about Japanese culture from and will remember this experience for a long time! The vegetarian cooking course was an informative experience, giving us insight into the traditional cuisine of Japan. The host was lovely and even guided us to her house after we got lost. She gave us an experience in the cooking process of green pancakes, flipping and cooking to perfection. She shared amazing advice and gave us further knowledge into Japanese cooking. In the end we learnt to set the meal up like a common family in Japan, and made us feel more local overall. It was an amazing experience and we would highly recommend this course. We had a wonderful evening with Akiko. Everything was as described on Voyagin and even better. Akiko prepared an amazing meal and tought us how to cook it. All ingredients were fresh and organic, which made the taste unique. The five recipes she created were seasonal and creative. Akiko is an excellent host and teacher and wonderful person, too. We had some good conversations with her (she's fluent in English!). And the communication before the cooking session was also great. Akiko holds the cooking session in her own beautiful house with a lovely atmosphere and knows a lot about cooking, vegetarian food and what makes food special. We couldn't have been happier with the experience, recommend it to anyone and will definitely come back if we're in Tokyo again. Thank you, Akiko! Great experience to have if you like cooking (and above all if you love what food means in terms of culture and social interactions in any country in the world). 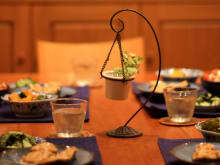 Akiko is a fantastic host, tremendously knowledgeable about nutrition and exquisite in her manners, behaviour and skills. But that is only half the fun. To have the privilege to meet her at her own house, in the intimacy of her own kitchen, opens up a whole universe of information about the inner workings of Japanese society. I feel that this very evening has taught me more about this fascinating country than the rest of the time spent here so far. Two important notes: she only works with prime, organic, first rate ingredients and I declare myself a big fan of Muku, her cheerful daughter. She is a gift, even if you don't get anything she says.